Free Toy Box plans - Free plans to build your own toy box or toy chest. What child (or parent) doesn’t need a toy box? A parent needs one to get rid of the clutter, a child needs one as a cool place to keep his or her toys and to learn about cleaning up after themselves. This woodworking plan is rather simple and can be painted to make it something that is geared more toward a boy or a girl. 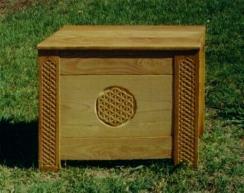 This is a woodworking project that you can have your child help you with. There are a number of steps where the construction is simple and doesn’t require dangerous tools. This is a good opportunity to get your child involved.